Ermegerd guys, it's been FOREVER since I've posted a book review. Mostly, it's because I went though a really dry spell where I didn't dig a book enough to write a review but recently, I've read a bunch and am now seriously behind. So, expect MANY reviews in the upcoming weeks. Some that will probably not even be on Fridays because I want to share the amazingness that is the last few books I've devoured. Ever read Forrest Gump (or seen the movie)? Well, The 100-Year-Old Man Who Climbed Out the Window and Disappeared is pretty much like that. Except that Allan Karlsson is Swedish and therefore, doesn’t speak in a southern drawl. Also, instead of a box of chocolates, there's a whole lotta vodka. However, the general vibe is extremely similar. 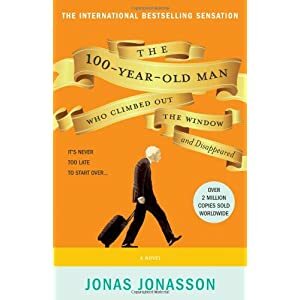 I’ll admit that when I first read the premise: that a 100-year-old man climbs out of a window so he can avoid his birthday party at his retirement home, I didn’t have high expectations. After all, what the heck can a centenarian get up to? The first chapter is his excruciatingly long walk to the bus station and, to be honest, I wasn’t sure if I’d keep reading but then there’s the second chapter and it’s BANANAS! Like, I-can’t-believe-my-eyes-are-reading-this-it’s-so-out-of-left-field, kind of bananas. My most favourite of all the bananas, for obvious reasons. There’s also a lyrical quality to the prose, almost like a fairy tale. It flows amazingly well. So well, in fact, that you hardly notice that there’s very little dialogue. And by very little, I mean almost none. The overwhelming majority of the novel is narrative so it is the author, Jonas Jonasson (did that guy have mean parents, or what?) who is really the star of the show because books with that much narrative usually bore me to tears. This one, however, held my interests hostage from page 11, right to the end. Yes, there are TONS of historical references; it’s the primary reason I (and others) compare it to Forrest Gump. The book goes between the present (2005) and the past, explaining Allan’s extremely colourful life. Wars, explosions, meetings with world leaders, prisons, asylums: Allan’s seen them all and, for the most part, conquered them all. I’m no history buff and will admit that there were a couple of times that I had to Google things but that’s a testament to how great this book is. Very rarely, do I take the time or have the inclination to stop reading so I can look up an event or person, just so I can enjoy the book more. And that happened, more than a few times. There’s literally no way that you would ever suspect what the next story would be about. Seriously. I’ll bet you a million trillion dollars that you’ll NEVER be able to guess. And because that’s the best part of The 100-Year-Old Man, I’m not going to say anything else. All I’ll say is that this book is totally worth the read. And if you get a hard copy, it has those really cool unfinished edges. You know, the ones that are all jaggedy and look like they’re old. Which is fitting, considering the MCs age (nicely linked there, HarperCollins). i love the title of the book ha!! welcome to the book club and cant wait to read more about it and your blog!